Deaths by Drone: Are they Illegal? Matthew Evangelista, the President White Professor of History and Political Science, moderated the 2013 Lund Critical Debate on drone attacks and international law Nov. 21. Debaters Michael W. Lewis, professor of law at Ohio Northern University, and Mary Ellen O'Connell, professor of law and international dispute resolution at the University of Notre Dame, focused on the issues and controversies surrounding the use of drone technology for "targeted killings." Jens Ohlin, professor of law in the Cornell Law School, joined the debate as a discussant. 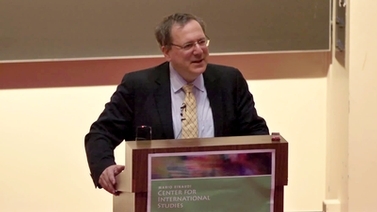 The Lund Critical Debates Series is part of the Einaudi Center's Foreign Policy Initiative and brings to campus speakers of prominence in international affairs who can address topical issues from a variety of perspectives.